This is no ordinary bike store. 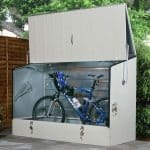 The Trimetals Metal Bicycle Store is high quality in every regard and has been designed so that it keeps your bikes or any other items you may want to store, safe, dry and protected in every way you could imagine. The materials used are so strong that this bike store is even fire resistant as well as being able to stand up against the weather. 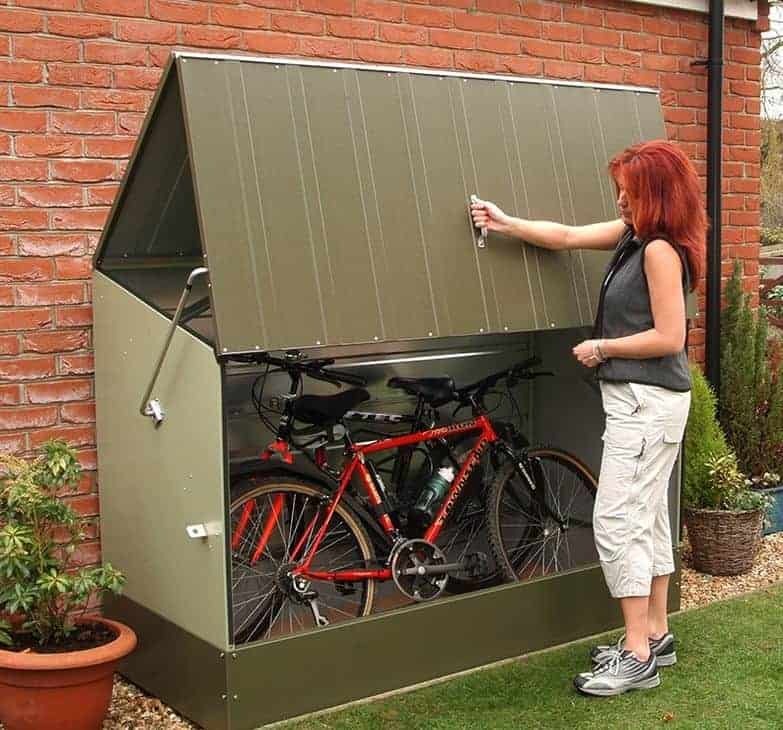 Available in two different colours, this is a bike store that will fit into any garden and with its sleek design will just blend in and do the job you want it to do without taking over your garden. 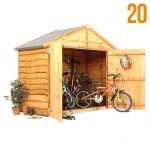 This is a high quality bike store and if you want to make certain your bikes and the kids bikes are kept safe and secure it is ideal in every way. 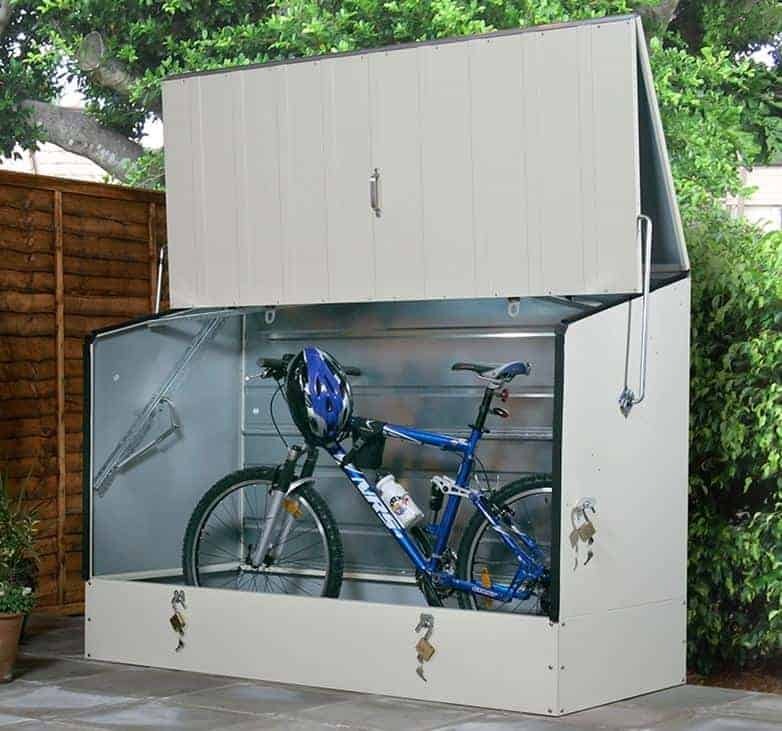 Made from galvanised metal to make sure that it will last for decades, this bike store offers you a safe place to store your bikes. 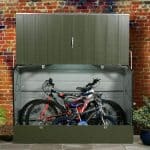 As well as this though thanks to the spring loaded design of the door, you will find putting your bikes away and getting them out again could not be any easier. After a long hard ride the last thing you want is a fight trying to get the bike stored. Well that will never be an issue with The Trimetals Metal Bicycle Store. Kids no longer have excuse to leave bikes on lawn! What we have here is a bicycle store that is just perfect for you fine folks who love to go cycling and want a secure, strong and good looking place to keep your bikes after a fun ride. Well that is exactly what you get her with the Trimetals Bicycle Store. 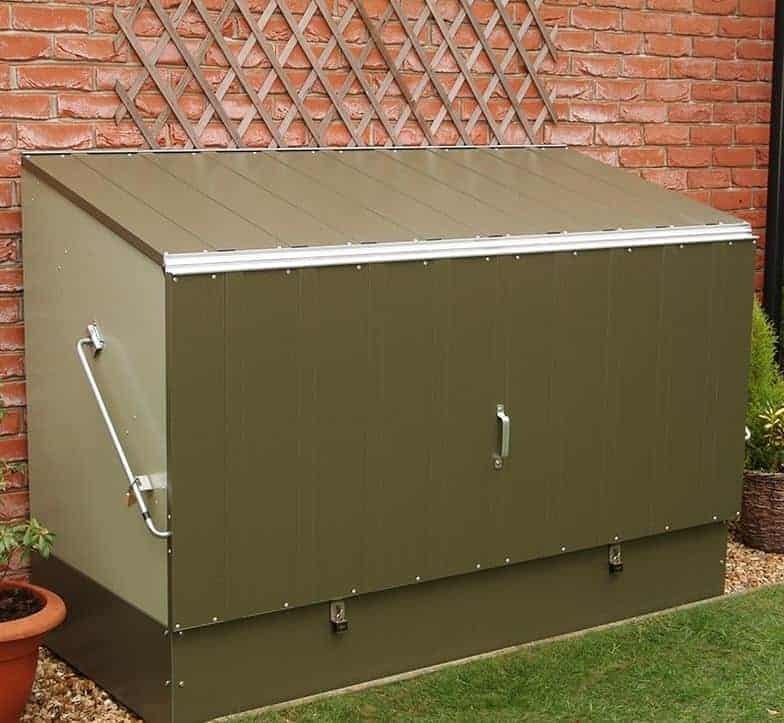 The whole body of the bike store is made from very strong and weather resistant, galvanised metal. This will ensure years and years of good service. The dimensions of the bike store are very impressive at, 6 feet 5 inches wide and 2 feet 11 inches deep. The lowest part of the store is 3 feet 7 inches with the highest being, 4 feet 4 inches. Of course what you really want to know is how many bikes can I store in here? Of course this does depend on the types of bikes you have, but you would have no trouble storing three average sized adult bikes inside. 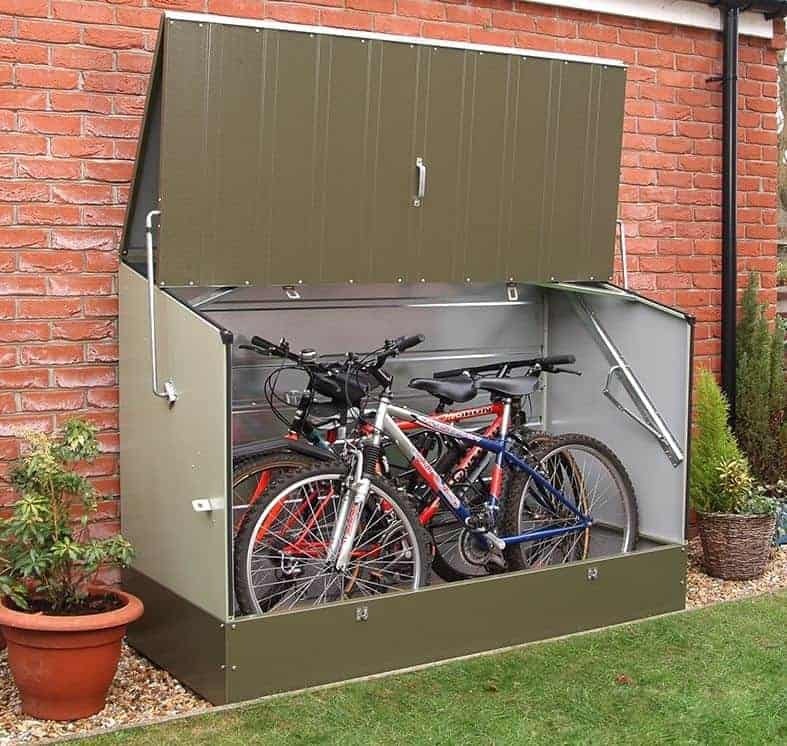 This does not have to be bought just to store bikes. Things like the kids outdoor toys, gardening tools and much more would fit right inside here also. The roof that Trimetals have used is very interesting. Actually this is not your typical roof it is more like a roof/ lid hybrid. It is a slight pent roof / lid which is what you want on a bike store as it will make sure the rain always runs off at the front. 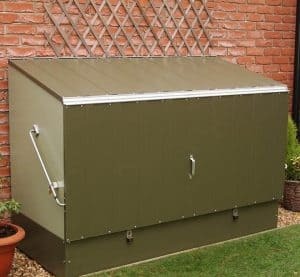 This like the body is made from that same galvanised metal and will last for many years even during our wettest and harshest winters your bikes will be safe and sound inside here. The whole of this bicycle store is made from that high quality galvanised metal and has a PVC coating to offer just that little bit more protection and give it a more softer and friendlier look. This is just excellent when it comes to keeping the rain out, which if you have expensive bikes, is exactly what you want as it stops them getting all rusted up. One thing that we really do like about the look of the bike store is how when it is all closed up, you really would have no idea at all what is inside. There is not really a frame to talk about here, but as the whole bike store is crafted out of that galvanised metal, you have a very strong structure that once built will offer you a very robust and strong area to keep your bikes in. The last thing you want to feel when trying to store your bike is a weak and flimsy wall that feels like it could give at any moment! Well thanks to design of the store your bikes will have no worries inside here. 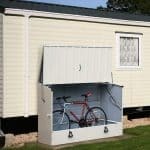 The Trimetals Metal Bicycle Shed is designed to be bolted onto a secure flooring surface from inside it. 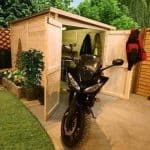 Something like a patio for example, but we think it would still offer a sturdy place for your bikes to rest if it were placed somewhere else in your garden. However, Trimetals do recommend a flat surface so that is something to keep in mind. One of the best things about this bicycle store is just how low maintenance it is. Actually make that zero maintenance because there is absolutely nothing that you have to do to this in order to make sure it keeps doing what it is supposed to do! Sure you might want to run a cloth across it if it gets dirty, but when it comes to actually doing something to make the bike store keep functioning then that is not required at all. This is weather resistant, fire resistant and with the right security measure, thief resistant. So with all that in mind, Trimetals offer you a 25 year guarantee on the galvanised metal panels on the bike store. 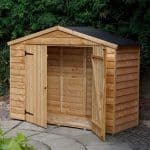 Talking about the door is a bit of an odd one you see as we mentioned up above the roof is kind of like a lid as it is all in one and joint to what is classed as the door. Now this does sound odd, but it is actually one of the very best features about this bike store. It opens from the front and is spring loaded so that it easily lifts and folds up giving you complete access to the bikes or whatever else you have inside. There is no struggling to get something in our out as the whole front and top section of the store is wide open. We love just how easy this makes putting bikes inside here. Even the kids will not be able to complain that it is too hard to put there bike away. To make sure that no one knows how cool your bikes are there are no windows on the bike store. This is actually something we prefer on a structure like this and are always pleased when a manufacturer resists the temptation to add a window just for the sake of it. The amount of security that this provides your bikes or other items is just incredible. We already mentioned how it is fire resistant and stands up against the weather, but cleverly, Trimetals have added a few sections where you can easily put padlocks. Now the bike store does not come with padlocks, but these can be picked up for as little as a pound and it is well worth doing so. When the lid is closed there is no way you are seeing what is inside here. The design of the bike store is such that any potential thief from just looking at the outside would have no idea that there were bikes inside. Trimetals do offer some customisation options with this bike store. To start with you have a choice of two different colour schemes. One is a more natural, all cream style and the other is a bit more playful being a two tone green. As well as this, Trimetals do offer additional flooring for this bike store. 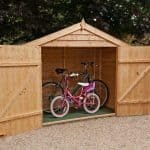 At an extra cost of £54.99 they will add in a strong wooden raised floor kit to raise the floor a little and make placing your bikes inside even easier. This is one of the most high quality bike stores we have seen in a long, long time. This has been made to keep your items safe and secure and it does exactly that. No complaints about the quality whatsoever. Trimetals offer a 25 year guarantee so you know that this is made to last. Being water resistant, fire resistant and very strong make this a bike store that is going to be with you for a long time. Being able to store 3 adult sized bikes we feel is a good amount of storage space. If used for kids bikes then you could probably even fit more in. As a regular space for storage, 6 X 3 offers you a decent amount of space to make use of. This is most certainly a job for two people and if you just follow the instructions, take your time and try not to get too frustrated then you will have this up and ready for use in around 2 to 4 hours. This really would be the only bike store you ever need to buy. And at £489.99 for potentially over 20 years of use we feel that offers just an incredible value for money. Final Thoughts: Anyone who likes to take great care of their bike will love The Trimetals Bicycle Store. 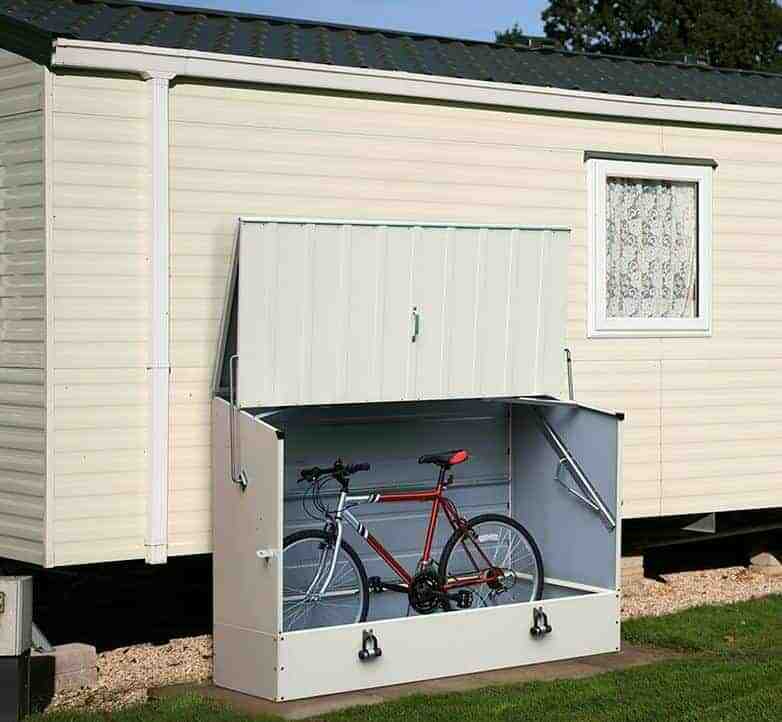 It offers you a great amount of space to store more than a few bikes and keep them safe in the process. One of the best things about the bike store is just how hassle free it is to first of all get your bikes in and out, but also hassle free in the way you do not have to do anything to maintain it. This will last you for a lot of years, and we think that this bike store could easily out last three or more bikes. That is just how good and reliable it is. 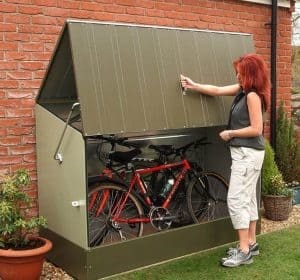 This is a dream storage solution for a cycling enthusiast and even as a general storage shed it would make for a great purchase.